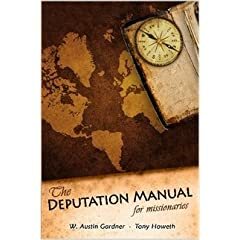 You can purchase the Deputation Manual for 99 cents for the Kindle right now. The book costs $17 on paper. If you own a kindle here is your chance. If you are a missionary looking for help with deputation this is your chance. This pre-field deputation manual has helped many missionaries to discover the fundamental keys to effectively raising support. This practical, biblical approach to missions fund-raising will answer your most important questions about the deputation process. From printing your prayer cards to filling your calendar to sharing your vision, the Deputation Manual contains the tools and teaching you need to succeed in this crucial period of ministry.